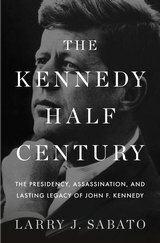 Although he was president only two years and ten months, John F. Kennedy was the most highly rated president by a wide margin in a poll of 2,009 adults who rated presidents from Dwight Eisenhower to Bill Clinton, according to Larry J. Sabato in his monumental "The Kennedy Half-Century: The Presidency, Assassination, and Lasting Legacy of John F. Kennedy" (Bloomsbury USA, 624 pages, 16-page color and b&w photo insert, notes, index, $30.00). The runner-up in the poll, conducted by Peter Hart and Geoff Garin, was Ronald Reagan, followed closely by Dwight D. Eisenhower and Bill Clinton (the poll results are in Chapter 21, "The People's President"). Presidents Gerald Ford, George H.W. Bush and Lyndon B. Johnson were pretty much even --and Jimmy Carter and Richard Nixon brought up the rear. Published on the eve of the 50th anniversary of events of Nov. 22, 1963 in Dallas, "The Kennedy Half-Century" deals in considerable detail with the controversy over the assassination, with Sabato reporting that most people refuse to believe the conclusion of the Warren Commission, that one lone gunman on the 6th Floor of the Texas School Book Depository in downtown Dallas -- Lee Harvey Oswald, a 24-year-old ex-Marine -- acted alone using an Italian bolt-action rifle to kill Kennedy and wound Texas Gov. John Connally. Sabato -- born to a devout Roman Catholic family in Norfolk, VA in 1952 and inspired by JFK and his presidency—explores the fascinating and powerful influence he has had over five decades on the media, the general public, and especially on each of his nine presidential successors. It may come as a surprise to many readers, but the runner up to JFK in the popularity poll, Ronald W. Reagan, drew upon the legend and the record of JFK to an extraordinary degree, Sabato writes, quoting a scholar (Page 348): "While Reagan quoted FDR 76 times between his 1981 inauguration and his 1984 reelection he cited John Kennedy on 133 occasions." Sabato notes on Page 349 that Reagan's "recurrent use of JFK was a carefully planned political strategy, on a par with Lyndon Johnson's regular invocation of President Kennedy." This obsession with the martyred president led the Republican National Committee to compile a "quote file" to show how much Reagan was in sync with JFK on many issues, from tax cuts to national defense, Sabato writes. A recent Gallup poll gave JFK the highest job approval rating of any of those successors, and millions remain captivated by his one thousand days in the White House. Despite the revelations of JFK's repeated womanizing and marital infidelity, he is still idolized by millions of people worldwide. Sabato renews the plea of many writers -- along with the vast army of Kennedy assassination writers and buffs -- for the federal government to release autopsy photos and other forensic evidence, something the government has refused to do. He argues -- and I couldn't agree more because I refuse to believe the conclusions of the Warren Commission -- that the information belongs to the historians and the public because it's a product of government work, including the puzzling choice of conducting the JFK autopsy at Bethesda Naval Hospital rather than in Dallas, as required by state law. On pages 248-9, discussing the events of Friday, Nov. 22, 1963, Sabato says that a conspiracy cannot be proved, nor can it be dismissed out of hand. He also says that there is "no doubt" that Oswald, who received outstanding marksmanship results with an M1 rifle in the Marine Corps, was "at least one" of the shooters, if indeed there was a second or third gunman. Sabato says there is also no doubt -- based on the ballistic evidence of Oswald's revolver -- that he killed Dallas Police Officer J.D. Tippit in the weird aftermath of the horrific events at Dealey Plaza. He also discusses the mob connections of Jack Ruby, the transplanted Chicagoan who shot and killed Oswald in the nation's first television murder. Doubters of the Warren Commission report 's conclusions included the majority of people queried by writers, along with Lyndon Johnson and the Kennedy family, Sabato writes on Page 252. He also discusses the role of the CIA and the unusual -- to say the least -- treatment of Oswald after he defected to the Soviet Union, married a Russian woman related to a KGB officer and then changed his mind and moved with Marina back to the States. All this at the height of the Cold War! While Sabato trashes the Oliver Stone film "JFK" which presents the most far-fetched conspiracy theories, he acknowledges that many younger Americans accept Stone's conclusions as gospel. Like many of my pre-Boomer generation, I was influenced by Kennedy. He was the first president I voted for, after I turned 22 in the fall of 1960 as a senior at Northern Illinois University in DeKalb, IL. I remember exactly where I was when I learned of his assassination that fateful Friday in November 1963. Sabato's "The Kennedy Half-Century" will appeal to history buffs and political junkies alike. There probably will never be a satisfactory answer to who did what on Nov. 23, 1963, but Sabato's book will answer many questions -- as well as raise many more. Larry J. Sabato is the founder and director of the renowned Center for Politics at the University of Virginia. He has appeared on dozens of national television and radio programs, including "60 Minutes", "Today", "Hardball", and "Nightline". He has coanchored the BBCs coverage of U.S. presidential returns and inaugurations, and has authored or edited more than a dozen books on American politics, including the highly praised "A More Perfect Constitution." His other books include "Feeding Frenzy", about press coverage of politicians; "The Rise of Political Consultants"; and "Barack Obama and the New America". Sabato runs the acclaimed Crystal Ball website, which has the most comprehensive and accurate record of election analysis in the country. In 2001, the University of Virginia gave him its highest honor, the Thomas Jefferson Award. He lives in Charlottesville, Virginia. "Need a quote/Do not tarry/Call U-Va./And ask for Larry."